Janicki asked us to modernize their website while keeping the general feeling of their old site with its strong blues and slightly glossed accents. They requested, however that we update the layout, typography, and style. The final site ensured that the key iconic elements from the previous site remained so that the new site remained familiar but more modern to visitors. 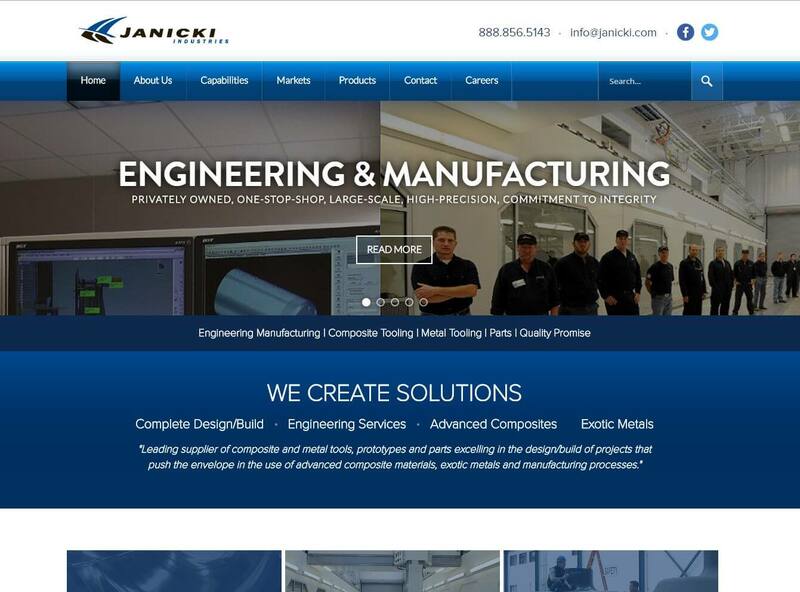 We worked with Janicki Industries to build them a new website using the Wordpress framework. The new system allows them to make edits to their own site, better organize their content, and reach a growing mobile audience. 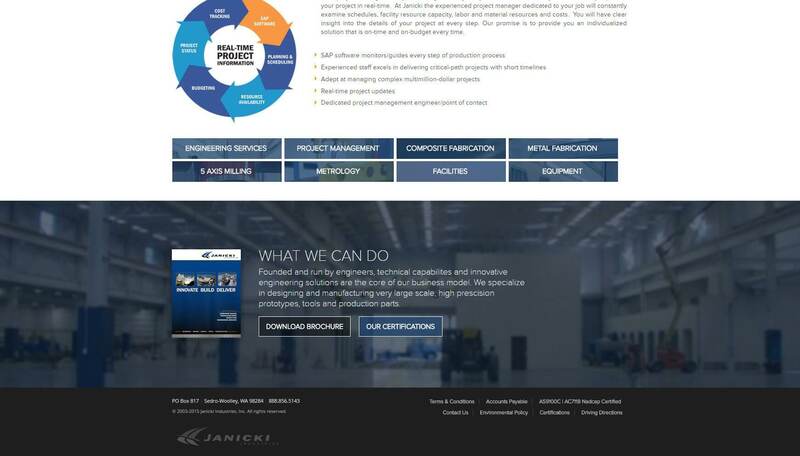 Janicki had us work through a major restructuring of the content within their site to better distinguish between their target markets, products, and capabilities as a company. FDGweb exceeded our expectations when they upgraded our website from Joomla to Wordpress. They gave our site a fresh up-to-date look and made our content friendly with mobile devices. Instead of an expensive total rehost, they were able to migrate our content at a fraction of the cost and schedule previously estimated. Their technical programmers are savvy with the latest technologies and easy to work with. They turned our requests and requirements into a viable site. They bring extra valuable ideas for formatting and content display which greatly improved the readability of our web pages. Thanks to FDGweb we were able to get our new website hosted in only a few months. 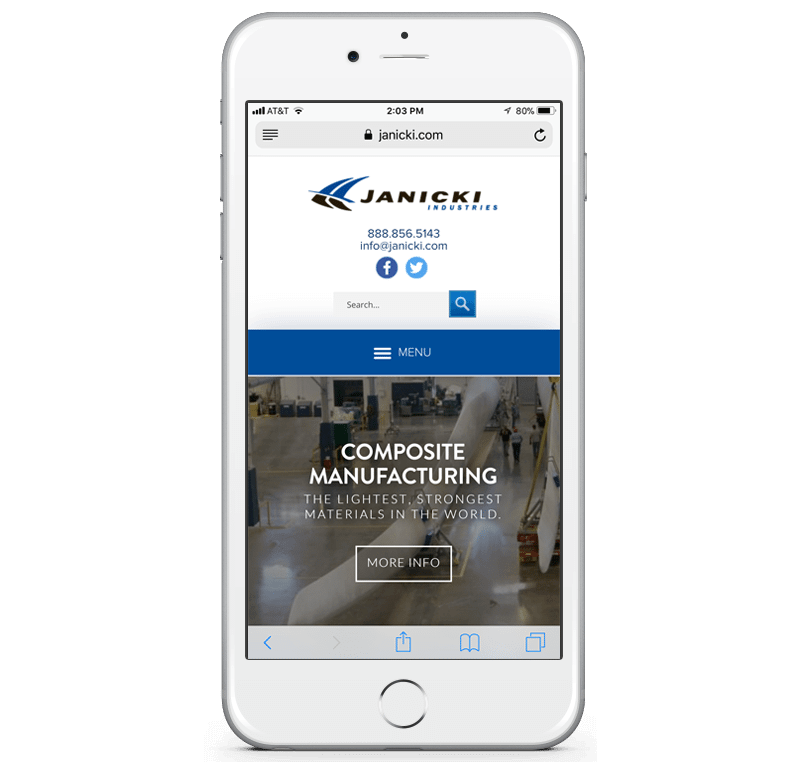 Janicki's new website fully scales to any sized mobile device while retaining the site's full functionality. Some elements are repositioned to optimize legibility and scale for different screen aspects, some elements are removed that don't translate to mobile, and some functionality is adjusted to ensure a better user experience.